I bet my first experience with pelargoniums — the flower — was like yours. I mistakenly called a pot of vivid red blooms “geraniums” and was promptly corrected. The bright pink and red flowers I’d seen in window boxes and on porches everywhere were pelargoniums. As my non-gradener mind understands it, geraniums are more sedate, with less showy flowers and, sometimes, scented leaves. Pelargoniums are the cheerful annuals sold by the flat at Home Depot. So, what does this have to do with Aedes de Venustas Pélargonium? Like its namesake, Pélargonium is vibrant, with crisp edges and big presence. A crafty gardener makes sure pelargoniums don’t upstage a carefully constructed woodland garden bed by putting them in pots on the patio. A crafty perfume wearer will do the same with Pélargonium, pairing it with a touch of drama to balance its rich, crystal-sharp notes. Nathalie Feisthauer developed Pélargonium. Its notes include bergamot, mandarin, clary sage, black pepper, cardamom, rose geranium, hedione, cedar, violet, vetiver, guaiac wood, iris, carrot seed, oakmoss, elemi, ambermax, and musk. This is the point in a review where I usually describe how a fragrance unrolls on my skin. With Pélargonium, I’m not sure where to start. It’s almost too much at once to pick apart. Pélargonium vibrates. It’s big, spicy, fruity (but not sweet), and purple with flowers, like a cosmic sorbet. It’s a swirl of tart green citrus, new wood, and a Turkish chef’s spice cabinet — with the window open to the shade garden. It’s the sort of fragrance that makes me a little bit thirsty for an Indian iced tea garnished with jasmine, sitting on a cedar plank table on an August afternoon. And did I mention that it’s big? Not only does Pélargonium last all day, when most fragrances devolve into a pleasant, slightly sweet warmth, it maintains its crystalline shimmer for hours and hours. It’s built like a fortress. Also, it’s perfectly unisex. On me, Pélargonium — like its floral counterpart — is fun in small doses. I’d love to smell what it does paired with the kind of charisma that commands a room. On the right personality, Pélargonium could be the olfactory equivalent of a crisp trumpet fanfare. Any monarch worth his salt wouldn’t enter a room without one. 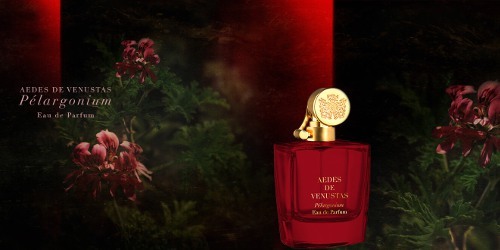 Aedes de Venustas Pélargonium Eau de Parfum is $245 for 100 ml. For information on where to buy it, see Aedes de Venustas under Perfume Houses. I don’t remember the last time I read such a combination of superlative descriptions. It sounds intense and engrossing! I must have had some particularly strong coffee when I wrote this review! Seriously, though, Pélargonium is a big, angular fragrance. I like this fragrance. I like this whole line, in fact. Good quality juice that seems to surprise me every time. I’m always interested in smelling what the line puts out, too! I’m in love with Pelargonium and I’m now a happy owner of that gorgeous red glass bottle. I also gave it a full rave in my review. I think this new Aedes was one of my top 5 releases that I smelled in Milan during Esxence. [side note] by total coincidence I’m wearing another great Aedes, Iris Nazarena today. Oh, I like that one a lot, too. Congratulations on your bottle! You smell great. Angela, I smelt this at Fumerie last month and had exactly the same sense of it as you. I loved it immediately, and the fact that I didn’t buy it immediately counts as one of those inexplicable lost opportunities…the boy I didn’t kiss back…the cat I didn’t stroke…the silk shirt I didn’t buy. Minor regrets in the scheme of things, but nevertheless, memories that don’t disappear. In perfume terms, I think that means a full bottle is a necessity, so when I go back to the States next year, I will remedy the situation immediately. Off topic, but as a follow-up: a few months back, you posted a positive review of J’ai Ose, and I almost simultaneously wrote in the daily perfume that it was a scrubber. I’ve come to trust your reviews so much that I have since tried J’ai Ose a couple more times, and I have to say, it’s growing on me, and not like a fungus, either. I don’t want to wear it every day, but I did put it on with jeans and a leather jacket the other day and really enjoyed the slightly tough vibe I exuded. You were in Portland and didn’t tell me! Well, I guess I’ll forgive you (I’m smiling as I write this, of course.) I’m sorry J’ai Osé wasn’t love at first sight, but maybe it will be an enduring friendship, at least. And, did you buy any perfume while you were here? I know you’re busy writing all the time, and I didn’t want to be a nuisance. Next year? We’re coming back in June (a bit later this time) to explore the Columbia Gorge from your end this time. I think….the dear man plans the trips. The important thing is that you had a good time! The Columbia Gorge really is beautiful, too. I love your writing style, waterdragon. “I loved it immediately, and the fact that I didn’t buy it immediately counts as one of those inexplicable lost opportunities…the boy I didn’t kiss back…the cat I didn’t stroke…the silk shirt I didn’t buy. Minor regrets in the scheme of things, but nevertheless, memories that don’t disappear.” Beautiful and something that everyone can relate to. Thank you! Mostly the words just tumble about, but I’, pleased that they make sense to you. Isn’t geranium used in smelling salts? I’ve found this note to be very challenging, unless it is barely detectable, just like eucalyptus. But apparently many have a much stronger tolerance than I do for these “slap in the face” notes! LOL. That’s a good question–I’ve never sniffed smelling salts. Pélargonium definitely does have some snap to it. It’s so hard to avoid those notes, though–especially vetiver! I always say, if it’s convenient to sample something that sounds worthwhile, it’s worth a spritz on the arm. If it helps, neither note stands out much to me. Oh, I’m still going to sample it! I’m open to sampling things with those notes. My concern was that several reviewers (not you) made it seem like they are prominent in the base. I can’t wait until the triple digit heat is over so that I can order some samples! Do let me know what you think, and if the vetiver is too loud for you! I’m hoping that it’s in the same ballpark as my beloved Flower Market, a discontinued Lush Perfume. It featured violet leaf, carnation, elemi, and galbanum. I keep it in the fridge. I just applied a tiny spritz, and I’m taking in its blazing green glory. Awesome. I’ve never tried Flower Market, but it sounds really nice. It’s heartbreaking when a fragrance you love is discontinued! Interesting that it’s such a strong fragrance when sprayed–I have a 2ml dabber sample and when I’ve used it I’ve found it a bit reserved and closer to a “skin scent”! I do tend to go for small applications from samples, though. Your review inspired me to douse myself more liberally at pulse points and it’s definitely more noticeable than my last sampling. I really enjoy this fragrance (and anything pelargonium/geranium) and may end up buying a proper FB someday soon. Great review as always, Angela! To me, this one felt pretty assertive and showed lots of character, especially compared to the soft-as-a-whisper Dryad I reviewed last week. I’m glad you liked it, though! It’s always nice to have another perfume love. This sounds like a wonderful, larger-than-life perfume. I’ve got to give this a try the next time I’m in Barney’s. I tend to love perfumes (Opium, Fendi, Coco, L’ Arte di Gucci) that fill up a room (much to the chagrin of my husband). This one is big, but not as ambery and oriental as the fragrances you listed. It has more sharply defined edges, too. I’d love to know what you think of it! Sometimes I think that most of the fun of perfume comes from sampling, anyway! That’s a great idea. Keeping track of tiny samples can be a pain. Plus, if you’re already paying for postage, why not up the sample size? Ideally, of course, we all live next to a perfume boutique loaded with the testers we want to sample from…. On me that’s a Declaration clone with some nuances of Terre d’Hermes. 100% imitation of J-C Ellena style. Now, that’s interesting! I’ve used up my sample, or I’d try it again with this in mind. That’s very interesting, from the description, they sound so different – going to look up the notes! Really want to try this as I love several of the other Aedes scents. I was afraid it might be weak like Oeillet Bengale, but apparently not. Good to hear it! This one is plenty muscular and lasts a good long time! Loved the review and I especially loved the mention of my favourite kind of garden plant: the geranium ( and not the pelargonium). The leaves of both members of the Gerianiacae have that characteristic smell that can be so bracing and refreshing. I like it and it reminds me of Déclaration as well. Funny that. Just got my sample (following your review), and so far this stuff is great!! I think I am also learning that I am a Nathalie Feisthauer’s fan. Thank you for the review, Angela! You’re welcome! It’s always wonderful to find a new favorite–fragrance and perfumer. After wearing this for a little bit longer, I totally got Declaration that antonpan mentioned (I am not a fan of Terre so cannot say whether it is there or not). While I very much like Declaration, I don’t think I am terribly fond of how it plays with the rest of this composition.